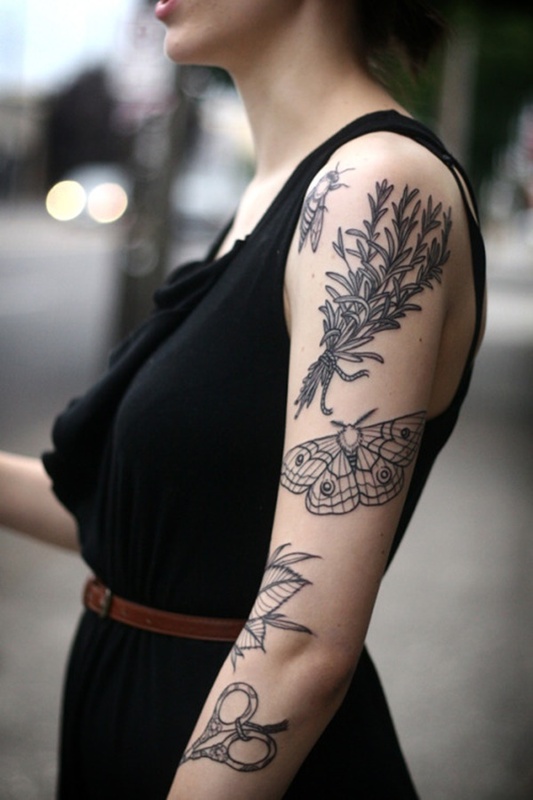 There are many feminine tattoo designs you can choose from today. If you’re lacking ideas, this post is going to offer you a catalog of 100 models you can pick from whether you’re a girl or a woman. The tattoo prejudice for women has faded away in the late years and we’re starting to see many that ornate their body beautifully, expressing their thoughts and ideas on their bodies. 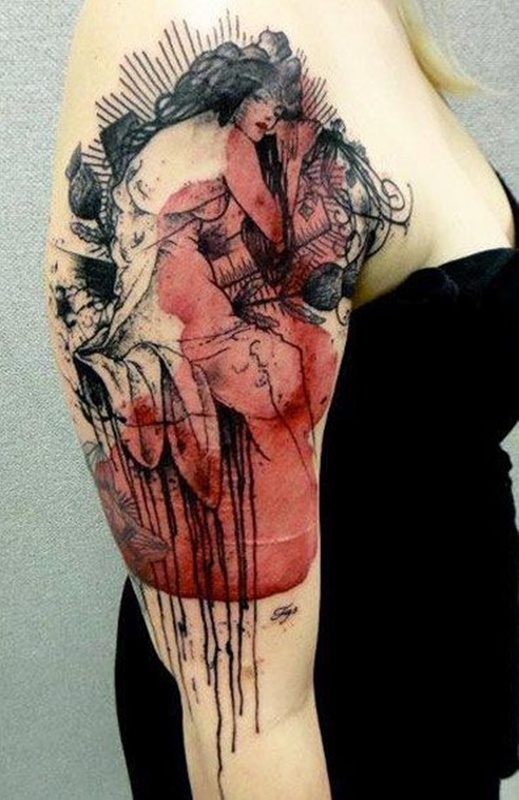 Today this is quite popular, and it’s not unusual to see big ink work on sleeves, ribs, or thighs. 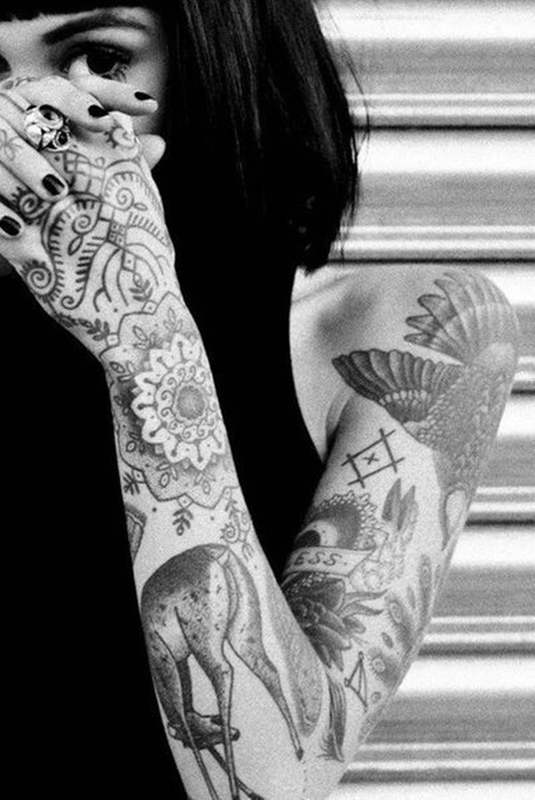 If you are a girl who is thinking of inking her arms, these real examples can offer you ideas for feminine tattoos, and let you see what they will look like on a live person. 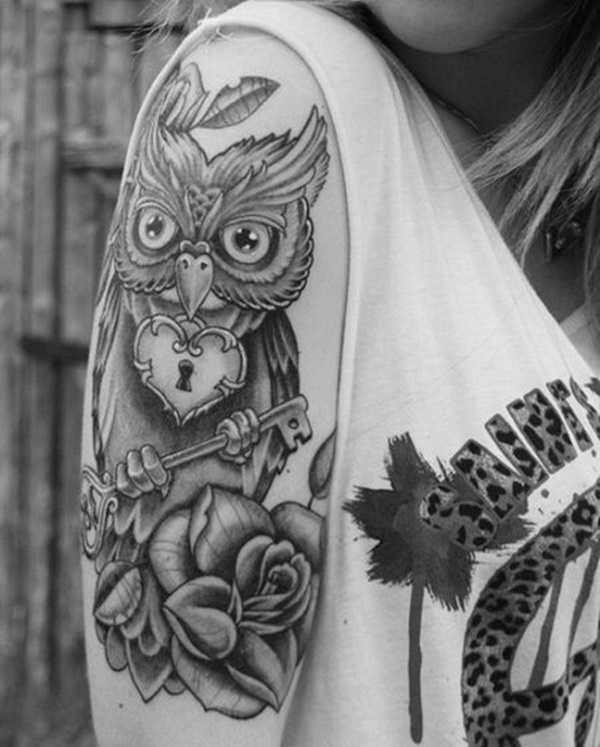 These images will give you a much clearer idea of what your tattoo can look like once it is actually on your body. Historical evidence shows us that people have been tattooing themselves for thousands of years. Decades ago, tattoos entered the western world through sailors, bikers, convicts, and so-called “circus freaks.” Tattooes were very underground when they first entered the modern western world, a lot simpler and most people had a bad impression about them. 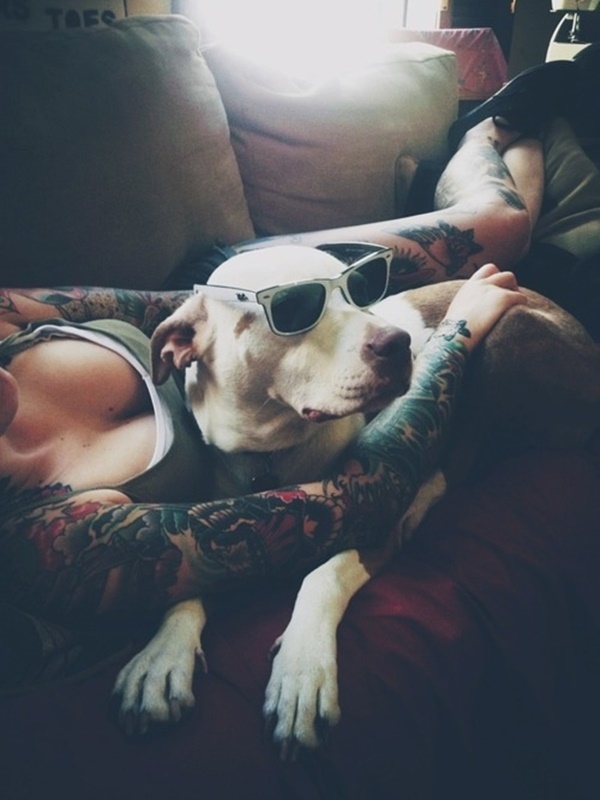 Forty years ago people that had tattoos were considered criminals, prostitutes and outlaws. 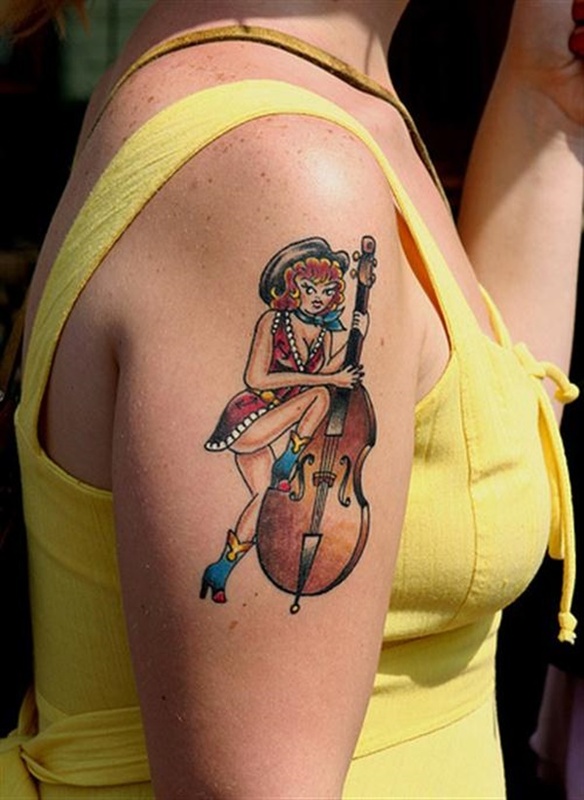 It was particularly taboo or shocking for a woman to have a tattoo, before recently. But now with the new freedom and equality women are enjoying, it has become more accepted by main stream society. 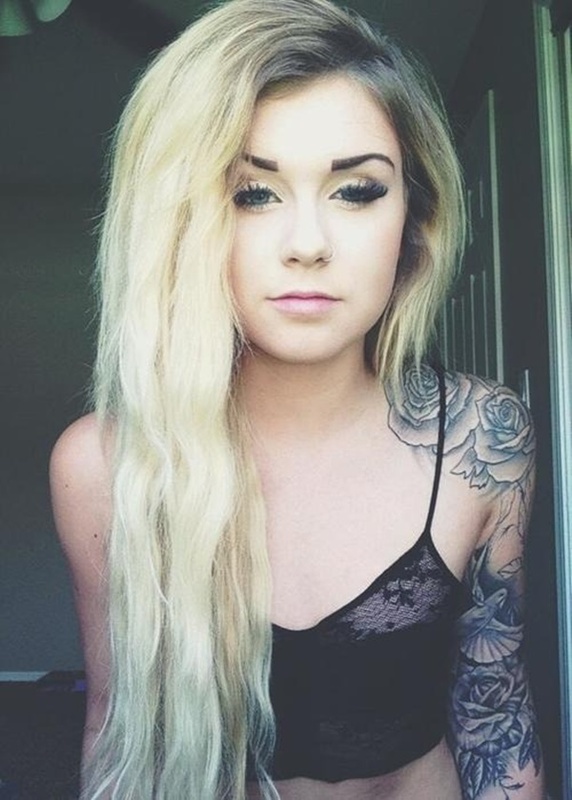 Many female celebrities now have tattoos, and not just those in the music industry. Even movie stars proudly display them, and do not hide them even on screen in their film rolls. The tattoo industry has exploded in the last 20 years. People from non-celebrity social backgrounds started getting tattoos after rock stars and well known people made them popular. Slowly the art of tattooing has been accepted on a larger scale and has bloomed socially, aesthetically, and culturally. It also developed as a big industry, fashion, and trend. Some of the finest artists in the world now do their work on skin. And of course you want a superior artist to do your work, for it will stay with you for the rest of your life. 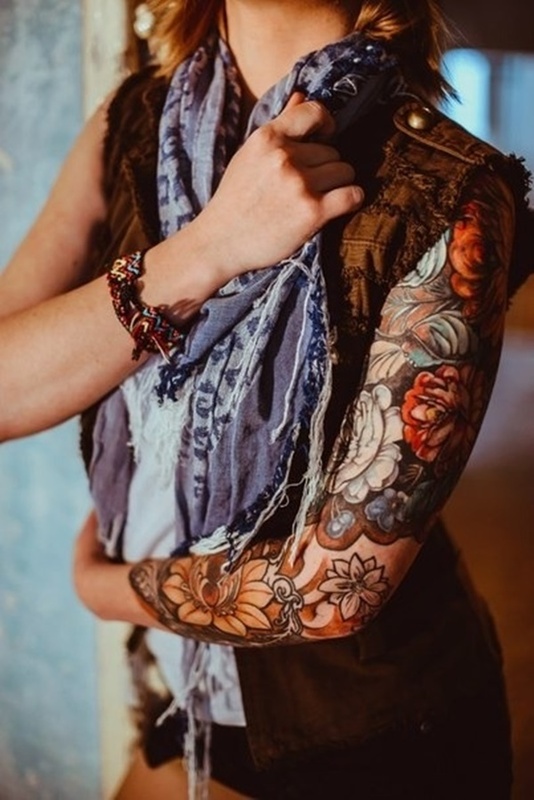 If decades ago women were stigmatized for a small tattoo, now there is a growing number of women who get tattooed, many of them getting large pieces like the full arm tattoos called sleeves, and full back and leg pieces. This phenomenon is now socially accepted in general, especially in USA and Europe. Popular motifs and designs for women tattoos include flowers, decorative patterns, wings, butterflies, hearts, birds, keys, ribbons, etc. Your only limit is your imagination. Many women will want to get tattooed to commemorate a significant passage in life such as entering adulthood, marrying, the birth of a child, loss of a loved one, graduation from college, surviving a brush with death. We all experience these powerful moments and some want to memorialize them on their skin, to forever be a part of their identity. Usually, a feminine design would typically be more delicate in design, colors, and lines, than a masculine one. However, as an independent woman, you are certainly free to choose whatever style and design is meaningful to you. 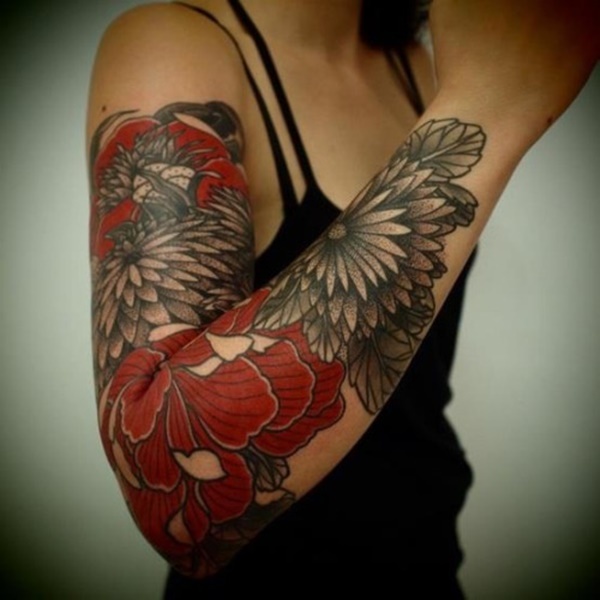 Above we have an example of a full sleeve inked in traditional style. There is a contrast of vivid colors against more muted colors, and natural skin showing through. The sharp, bold lines and dark shading dazzles the eye. Elements flow together beautifully. A feminine profile portrait holding a candle, floral motifs and a blue diamond. 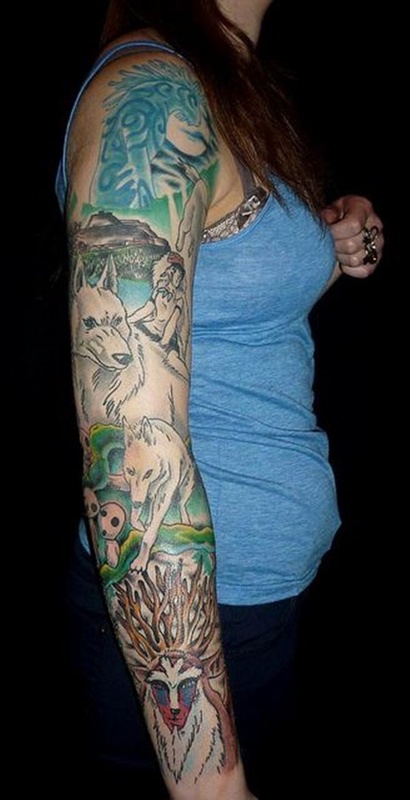 This woman has both arms inked. 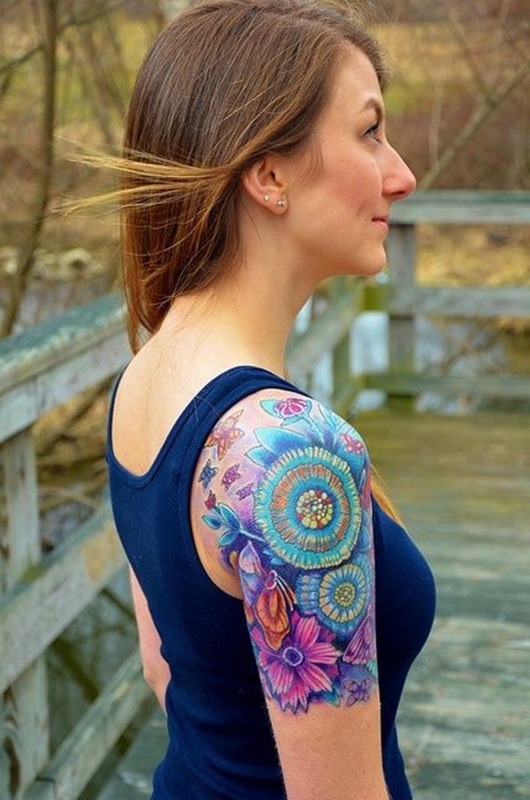 Full sleeve, intensely and brightly colored, and flower ornamented. The design is dense with saturated colors, leaving little to no skin space showing in between. This makes this resemble a decorative clothing fabric. 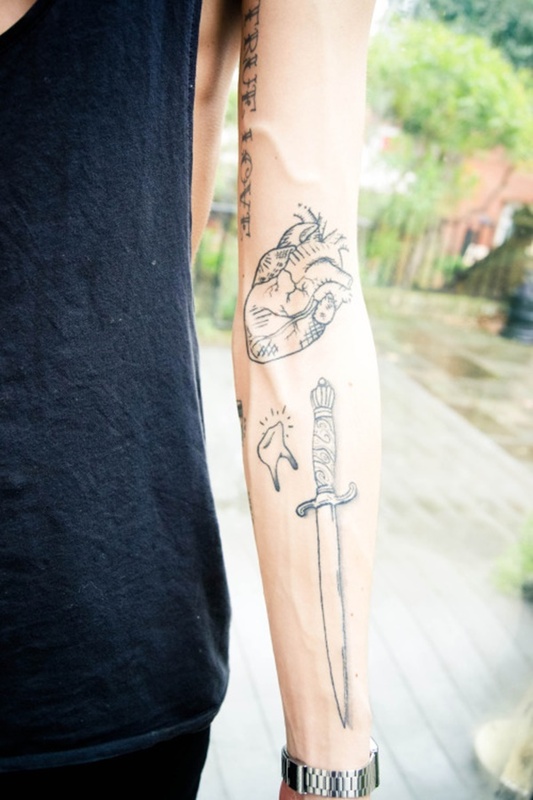 Independent and unrelated tattoo elements put together in one arm, each representing something different to the owner. These designs appear to have little artistic or themic connection to each other, but it’s safe to assume, they are very meaningful to the woman who has them. The arm tattoos seem to represent different and distinct events, placed all over the arm. 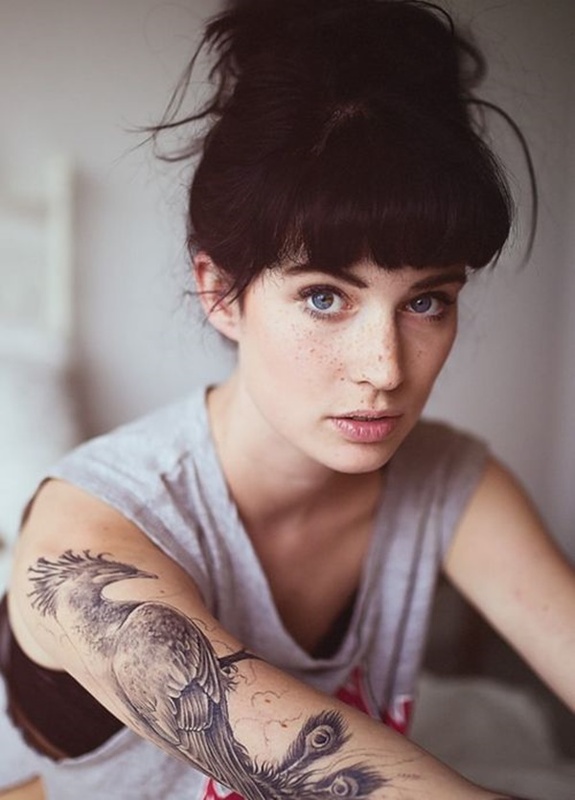 Girls can get a simple little design for their first tattoo, if they are feeling timid or unsure. Or if feeling bold and confident about their decision, they can get a big piece done with shades colors and details that aren’t meant to be covered or hidden. 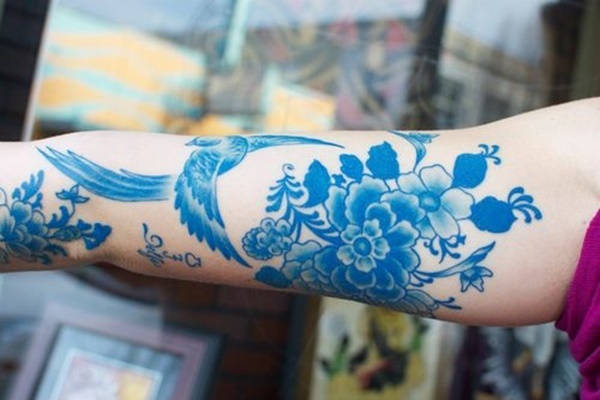 Usually large pieces can take a commitment to several sessions, and the skin must heal completely between sessions, to prevent scarring, or loss of ink. 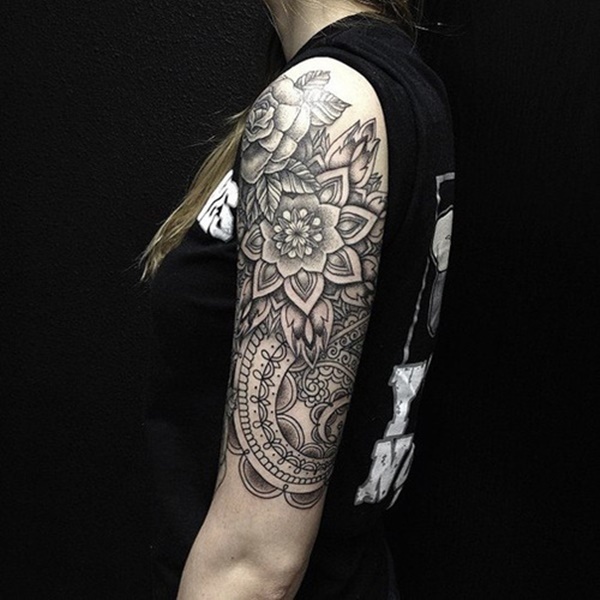 A woman can ornate her body just to make it more beautiful, using floral motifs and decorative patterns, or she can get a commemorative tattoo with a meaning that marks something special and is symbolically powerful. According to the design, shape, and size, the placing of the tattoo will be laid down on certain areas of the body, to accommodate the space and shape needs. You can use your wrist, forearm, or ankle for small designs. Arms are a great area for big pieces that require lots of details, definition, shading, and flow. You can get a big piece that will stretch across your entire arm to flow with the shape of your curves, or use small, interconnected designs to fill it from your shoulder to your wrist. A beautiful example of the floral motifs, complimenting the shapes of the arm. Complex nature design using mostly gray wash, with small bits of color. Very feminine gray wash suggestive of the Phoenix bird. 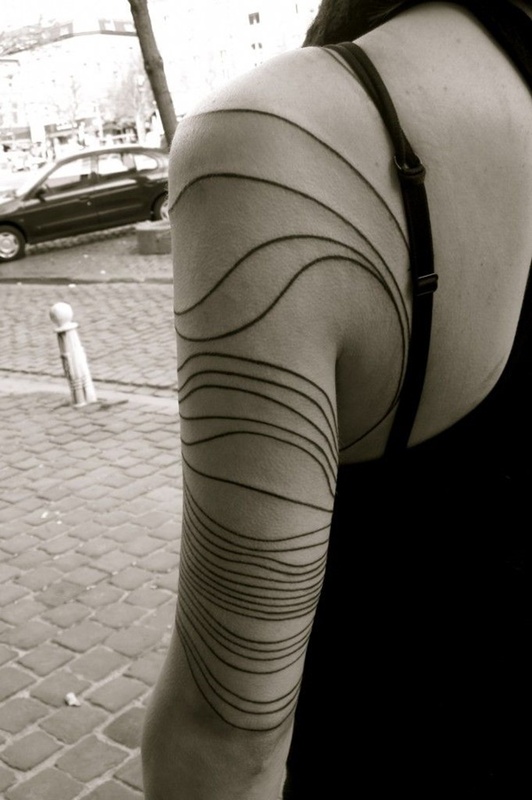 Intricate flowing lines spread along the arm forming that hair of a woman. Leaves and geometric patterns decorate and crown it and lend it a visual rhythm. 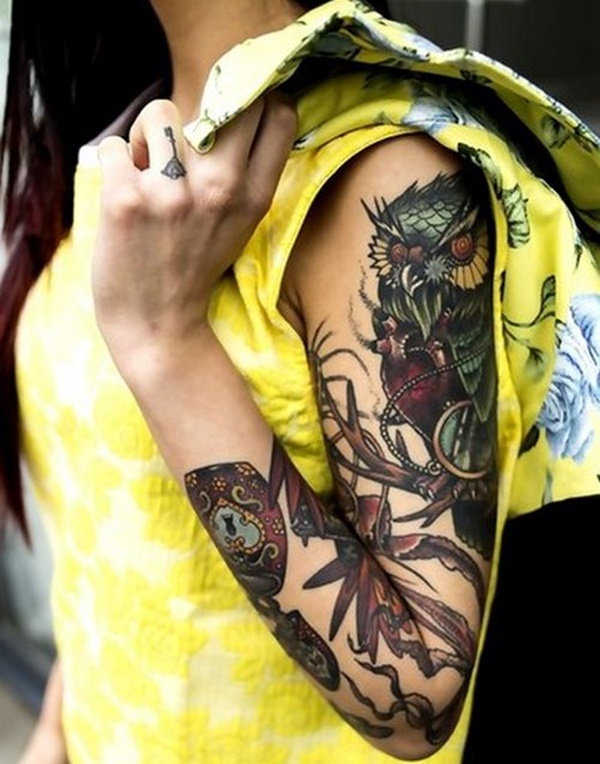 These floral and, bird, and woman tattoos on the arm, seem almost like a garment matching her thigh. Very “one of a kind.” This surely means something special to her. It seems almost like chain jewelry. Traditional full sleeves with bright colors and reminiscent of the Japanese style. 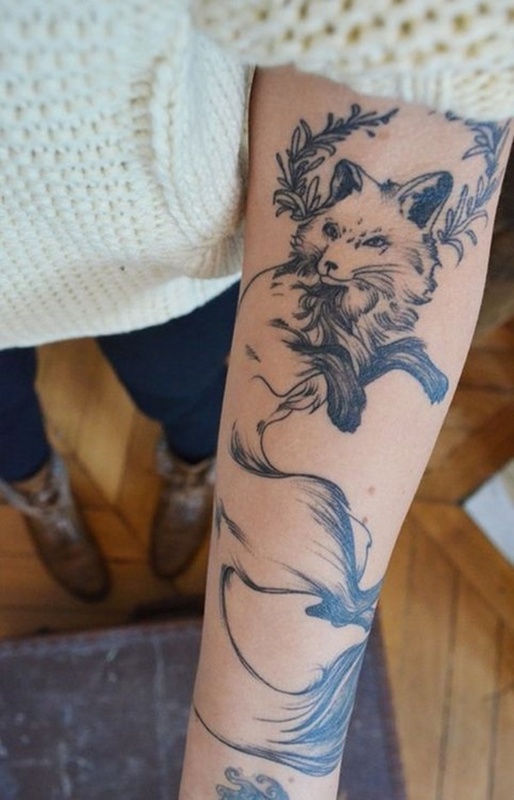 A fox flowing nicely across the arm done in line work. Could this be her totem animal? You should choose your design colors to fit your skin tone, and think carefully that it will resonate with your personality, and flow artistically. Always consult with a skilled tattoo artist before you make your final decision. Expressing your femininity can be done with unlimited variations and shapes. If you want an “in your face” effect, you can get a full arm that won’t be possible for people to miss. You can opt for bright colors, or black and gray. Some colors do tend to look better on whiter skin. It’s a good idea to take it easier on your first tattoo, especially if your tactile senses are over sensitive. If you start with a small one first you will get used to the needles, the discomfort, and the entire sitting and tattooing process. Remember, once the needles go in, you are committed and you need to finish the session. After you achieve the first one, you won’t be so surprised by the experience should you decide to get another one. Some people experience pain, stomach upset, or feeling ill when sitting too long under the needles. Have cold juice, soda, and possibly crackers with you, should you get a little shaky. Some artists have a softer hand, while others have a heavier one. Saturated colors might hurt more too, since they need to be repeatedly applied into the skin. Art Nouveau type design. Some people get the line work done first, then let it heal and think about getting color added later. That way, the line work tattoo is complete, if you should decided to stop at that point. Another example of a possible two stage tattoo. It is black line work, that can later be filled with color. Very geometric and rhythmical, suggestive of stained glass and sacred geometry. Looking deep into the design, a Wild West theme can be seen, along with words that personalize it. This seems to be a commemorative design, as there is a name below the design of the woman’s face. Two distinctive designs, but they do resonate as floral motifs. Bright, candid colors and American classic motif that contain a hidden significance, known only to this woman. For instance the elbow spider web could mean being trapped. Very distinctly different designs, cross-stich, an animals, a name, a bird, makes you think each one represents significant events, or moods. The beauty of seemingly random designs, all very feminine. Sophisticated patterns flow symmetrically across the arm. Echoing East Indian art. Very traditional “wall flash” type designs, which were very popular in American, before tattoo artists became so individually stylistic in the recent decades. 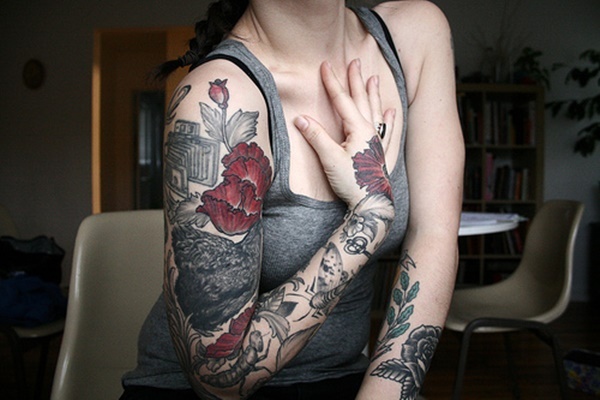 Bold, floral sleeve, even covering the back of the hand. This one cannot be hidden! Highly individualistic. the read almost looks like blood. 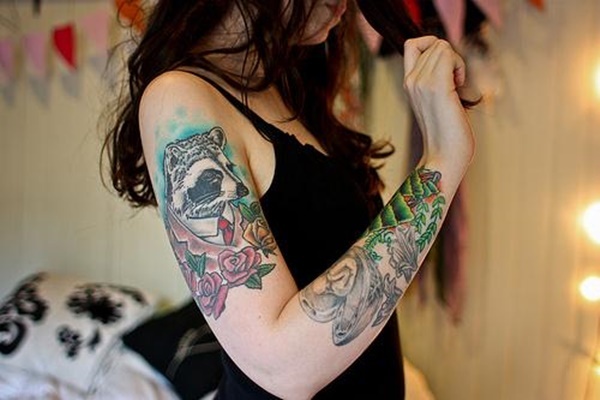 The upper arm features a woman face with a deer mask on her head, nested in brightly colored flower decorations. 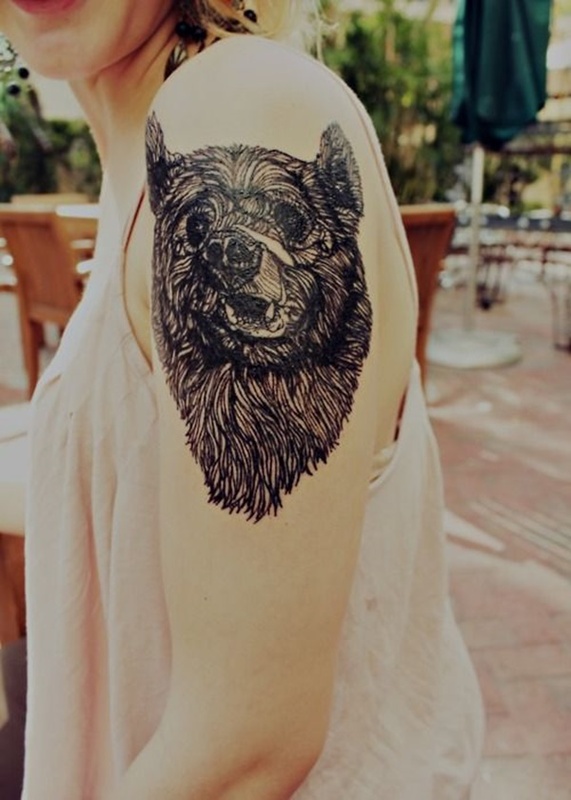 On the lower arm, a black and grey piece of a man with a bear mask, contrasting the upper piece. They seem to be a pair! 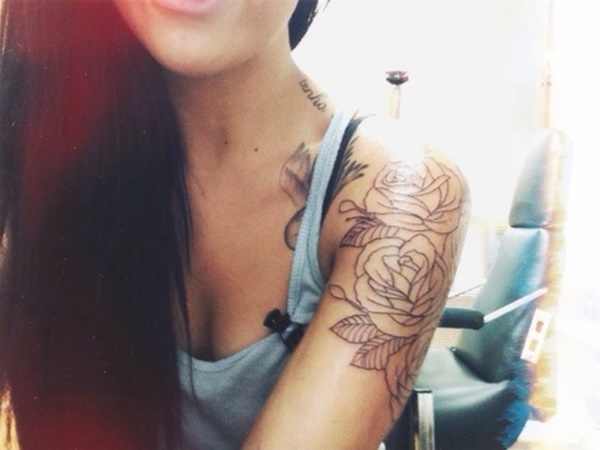 Roses are very popular for feminine tattoos. They serve beautifully as decorative pieces and are always attractive. Dramatic black, gray and red. No way to miss this one! A tribute to Bruce Lee, and others, an example of a commemorative tattoo. The butterfly is a popular choice for women, and these are dramatically featured in a more muted background. It’s impossible to miss the personal significance of this message. Perhaps she freed herself from an oppressive situation? Echoing bold fabric designs of times gone by. Soft line work, with bold pastels, a very feminine look. This one had to be carefully planned out over several sessions. Many different designs but they all come together as one piece. The colors jump out ifrom all of these sleeves. They look somewhat Japanese in style. But you see flowers, fruit, faces, even a mummy! Very bold work with solid black. This likely took more than one session. 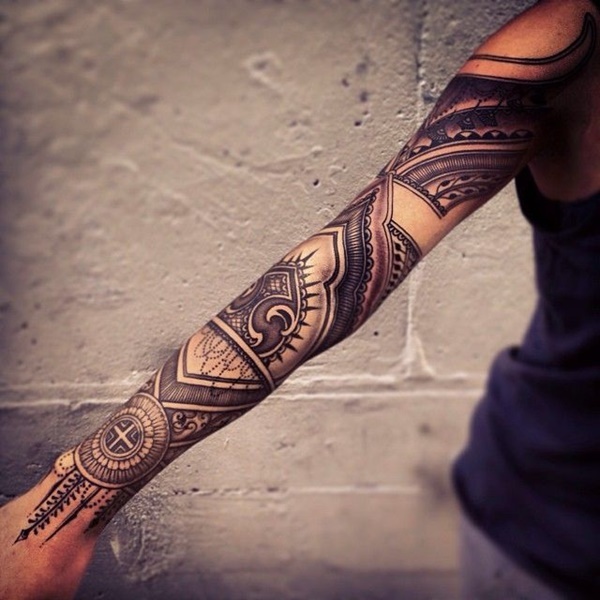 Though the designs are all unique, the type of line work ties them all together. 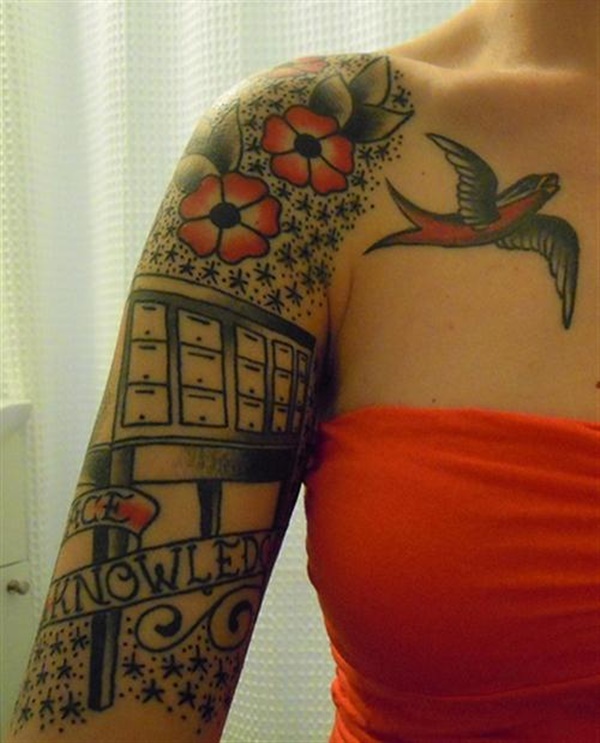 This tattoo would make you want to get close and read the text on her skin. Extremely bold color work. This type of color is not seen too often. Lock and Key motif, likely personally significant to the wearer. Delicate line work styled like traditional Romanian embroidery and lace. The Kabbalah Tree Of Life nested in shapes like crystals. 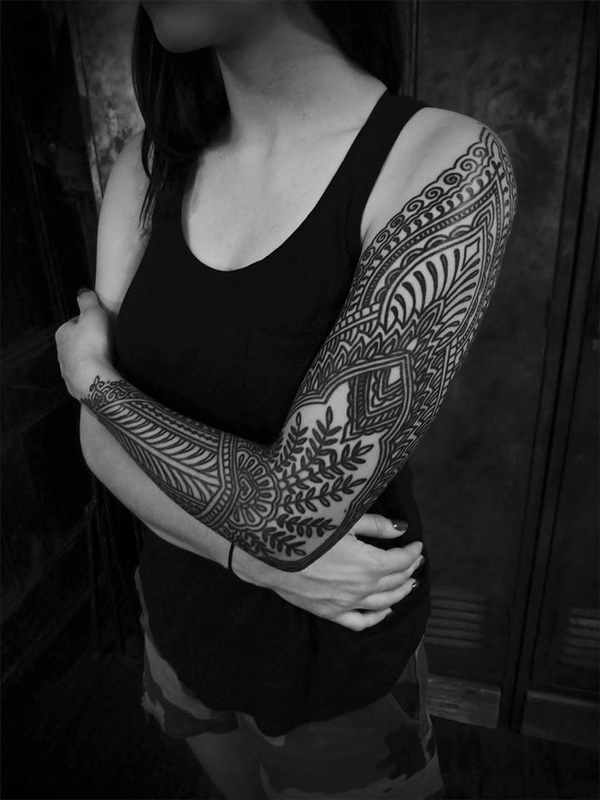 Her sleeve reminds of indigenous art, such as Australian Aboriginal, or Native American. Playful, yet bold, bright colors and line work that stands out. Day of the Dead Sugar Skull, and bold Mexican style colors. Complete sleeve, with text, and something personally meaningful. Highly unique, art deco type style, based only on heavy line work. This would require an artist with a very steady hand. Symetry and correct placement are detrimental to this style. Another view of the Mexican Day of the Dead Sugar Skull. 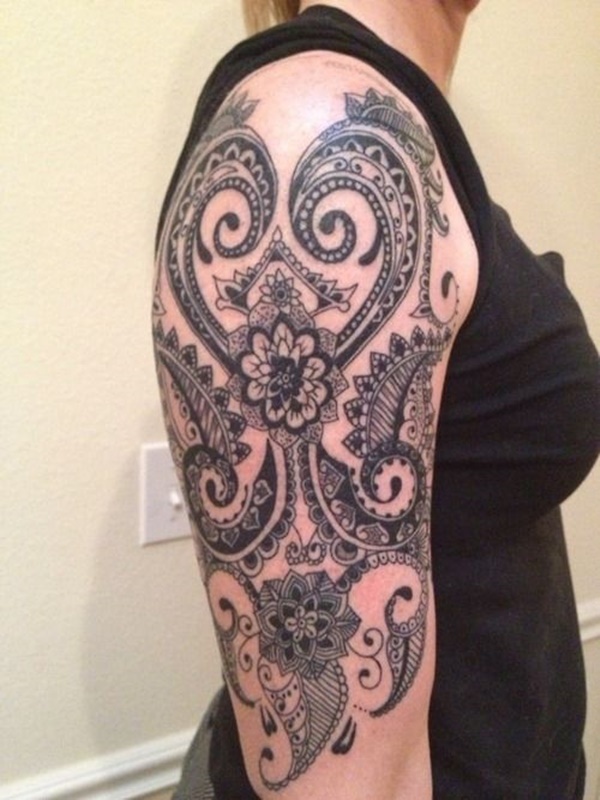 The dramatic effect of many tattoos in black and gray, accented with small amounts of color. Dark, rich colors make a statement. A wonderful seascape of exotic illustration. The arm’s length is cleverly used to display this tropical landscape, starting with the depths of the sea at the base of the wrist, rising to the shoulder to show an orange sunset with palm trees’ silhouettes. Large designs are easy to see, and understand. Bold colors, the beautiful rose, but with an over all soft appearance. Another Art Nouveau style with a complex and detailed design. Absolutely unique! 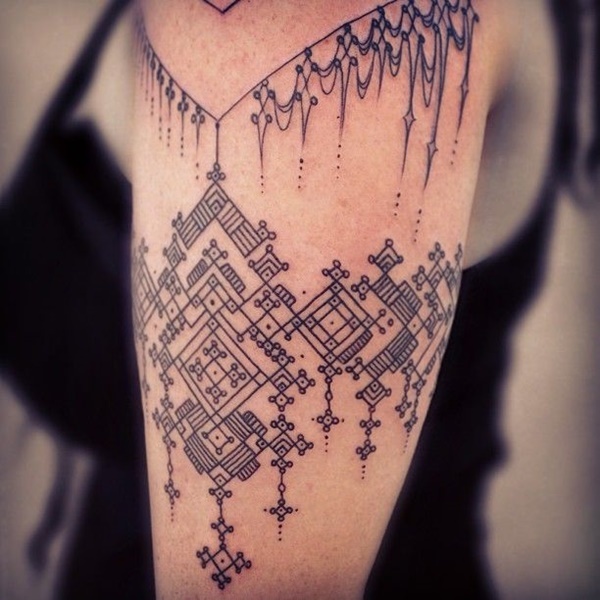 The depth and density of the black means this lady went through a lot to receive this tattoo. 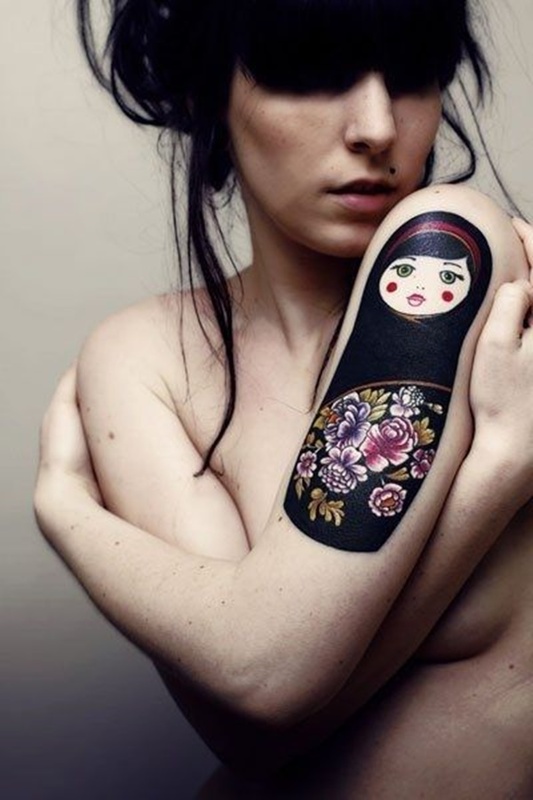 Distinctly different tattoos, set apart from each other, probably signify distinct moments in this woman’s life. Another one portraying nature, this time an pink lizard climbs leafy vines, all flowing beautifully across the arm in vivid nuances of green and pinkish red. 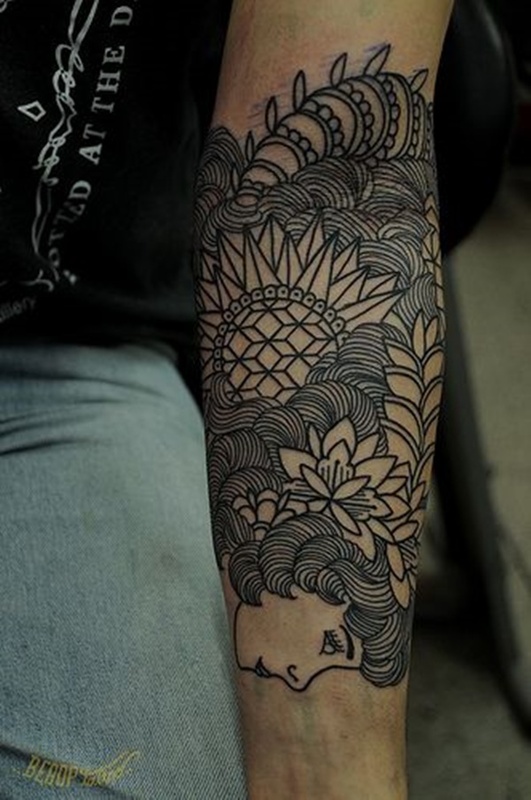 Above we have an example of how sleeve designs can blend well with leg and foot elements. Black, grays, and reds always catch the eye. Rhythmical petals and flower designs, graced with butterflies and birds, so very feminine. Whimsical characters, likely of personal significance. Softer over all effect of color and line work. Drama here, with mythical figures. The colors used in your ink work can set the mood and atmosphere of the tattoo. The one above looks very bright and fearless, thanks to the color palette used. 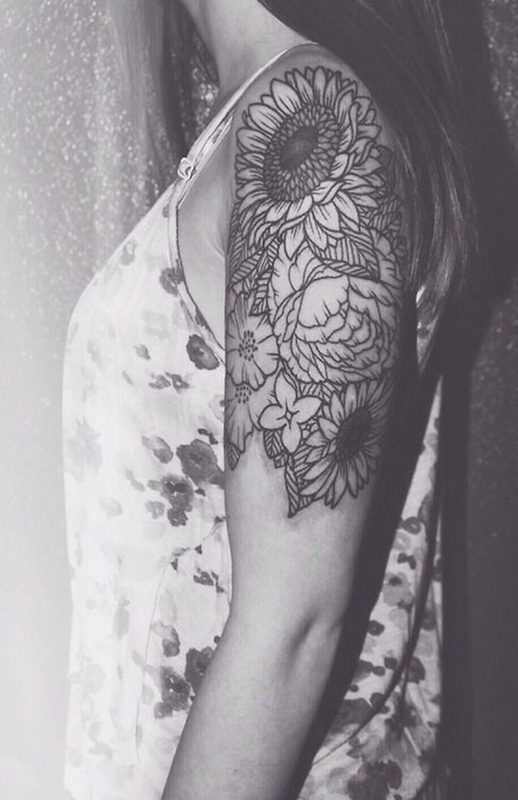 Flowers, faces, softer colors and line work, the same throughout all the tattoos on the arms, harmonize with the others on her legs and chest. Very dark and rich color, deep black rather than gray wash, give these sleeves drama. This desolated landscape can suggest a mental mood. 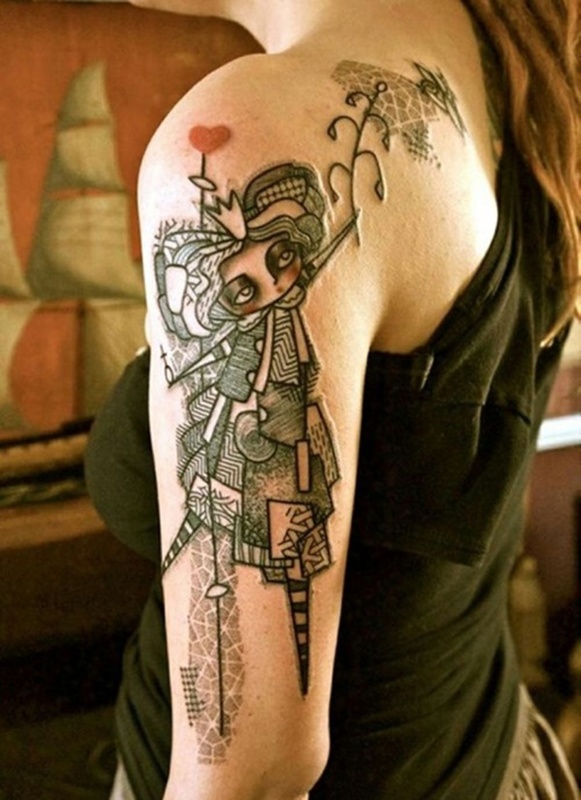 Another view of a tattoo seen earlier, combining distinct images. 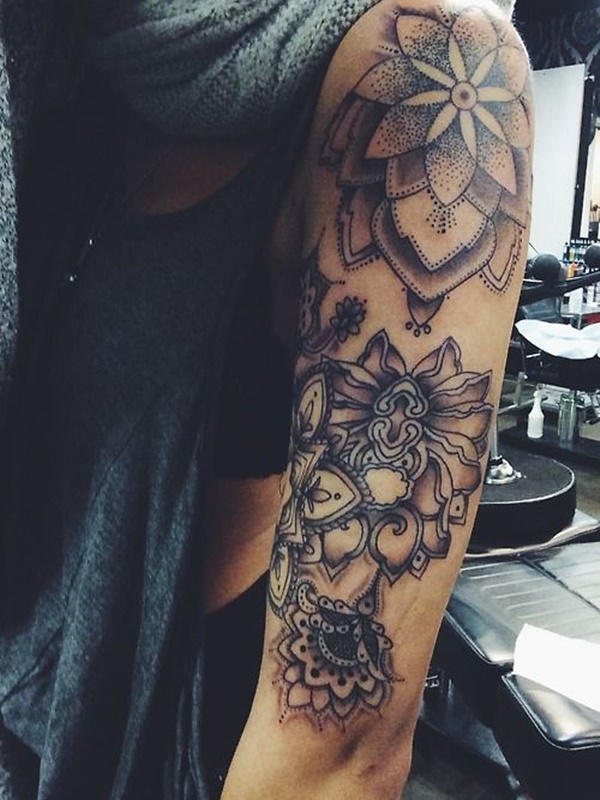 You can conceptualize your arm designs to blend well with other tattoos from different areas of your body, like the legs, back, ribs, neck, etc. 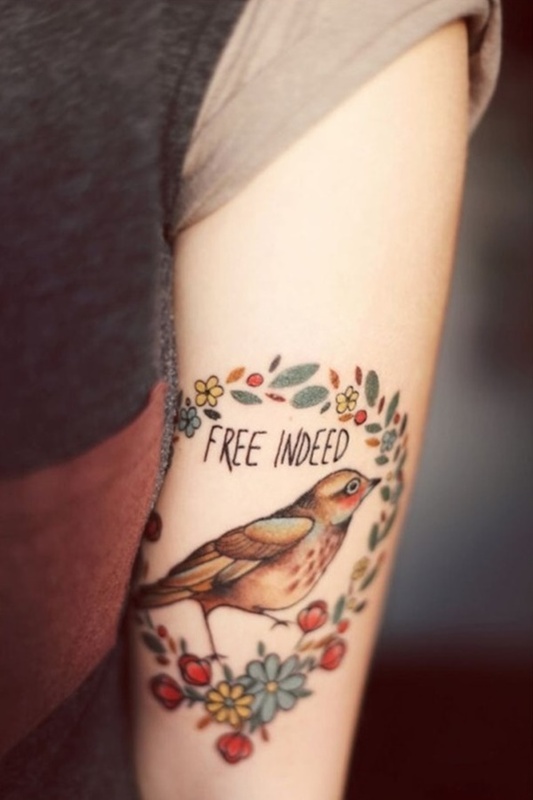 The bird is set free! The intense rhythm and boldness of the black in the line work is softened by the gentle flowers and leaves. 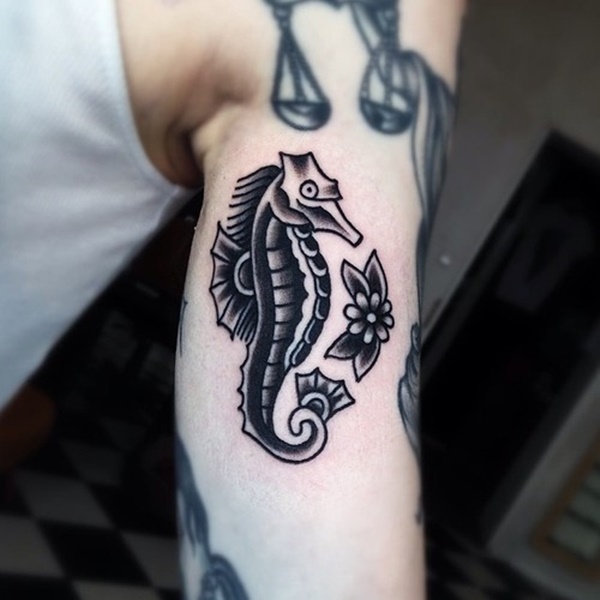 Seahorse tiny tattoo done in traditional manner but with no colors. Thick lines and heavy shading make it easy on the eye. Single color, without any black line work – a very soft effect. Flowing lines are feminine. Note the illusion of light in the center of the butterfly. A personal message framed with flowers and birds. A ribbon bow decorates her wrist. Tiger lilies and Kanji. Let’s ask her what is says! 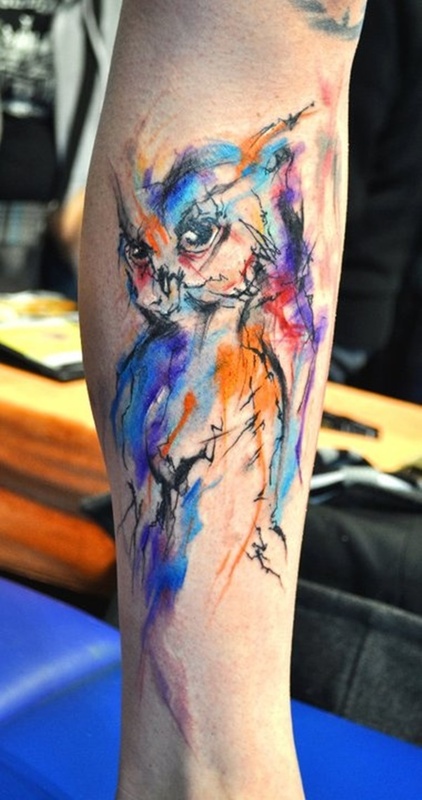 An extremely unusual approach in watercolor style for this owl tattoo. The owl is a dark night watch bird while the colors used are from the rainbow spectrum. So bold it could be confused with a bright blouse sleeve. Perhaps remembering a beloved pet, this design is done exclusively by lines that show rhythm and follow the shape of the bear’s head. Bold yet very feminine, with more color than black. 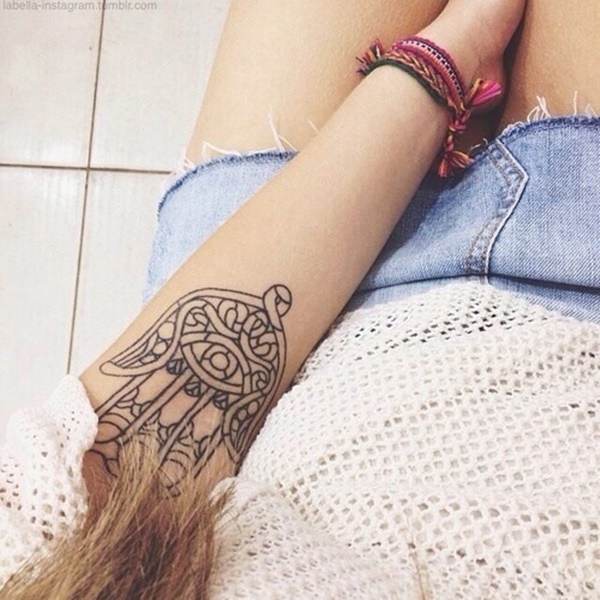 The Hamsa, ancient symbol of protection, found in India and the Middle East. A traditional function of tattoos was for religious beliefs. A beautiful blend of nature, animal and flowering tree, and crescent moon. A third view of a black and gray compilation. Darker black and gray work, the shoulder echoed in the wrist. 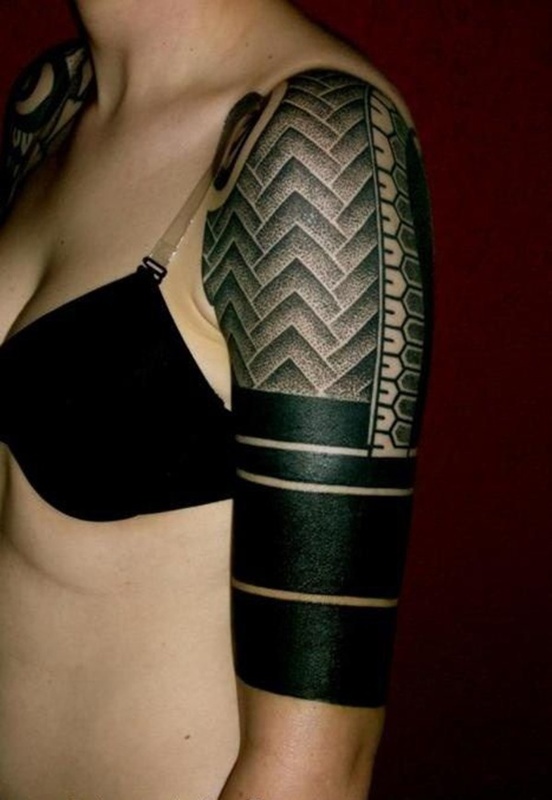 Black line work with a lot of blank skin in between the individual pieces. The scissors indicate these have personal meaning to her. The twisted black lines and negative space successfully create an optical illusion that tricks the eye, creating depth, space, dimension, and volume. 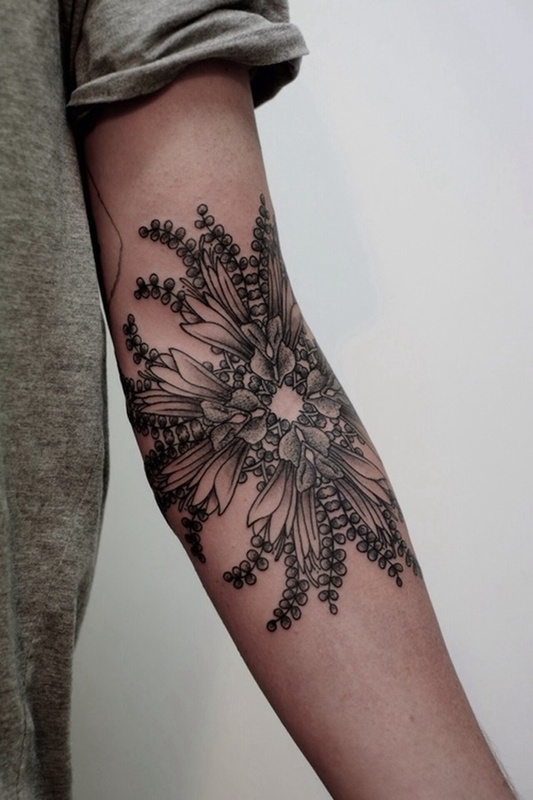 Delicate lines, and these are fresh because the reddening of the skin from the action of the needles is still visible. Likely she will have them color filled after they heal. Another owl tattoo, this time done in traditional style. Tattoos appearing to be from “wall flash” designs. 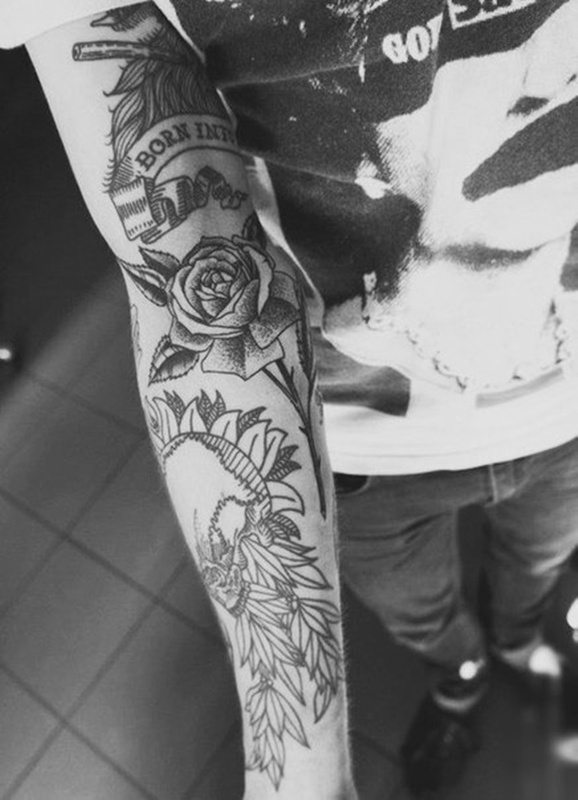 That is, small designs posted on the walls of many tattoo studios, especially in days gone by. Extremely one of a kind! This looks to be a singular piece of art done by a skilled artist, just for her. Various patterns, lines and textures offer different effects that contrast and complement each other. 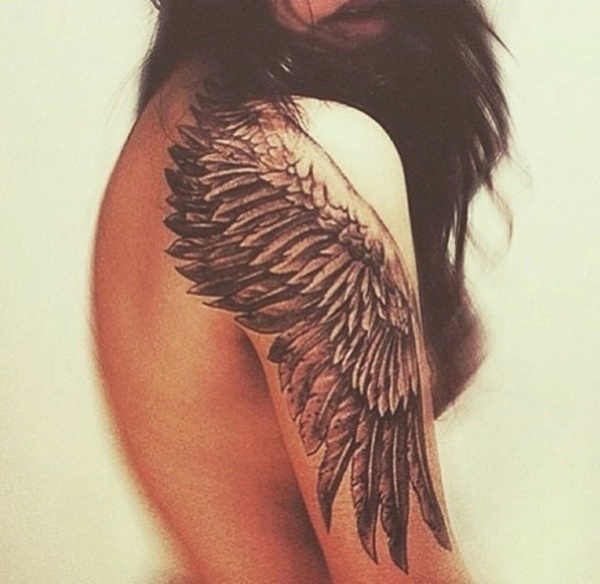 These remind of us of the tradition of “biker” tattoos, yet they are lady like. The inside details are rendered through dots and lines lacking shading. Done as individual works, she seems to be slowly filling up her arms until they become full sleeves. Designs that nicely flow around the natural body shapes. A collage of many different shapes, ideas, and images, seemingly unrelated, and possibly personally significant, make for a strong statement of personality. 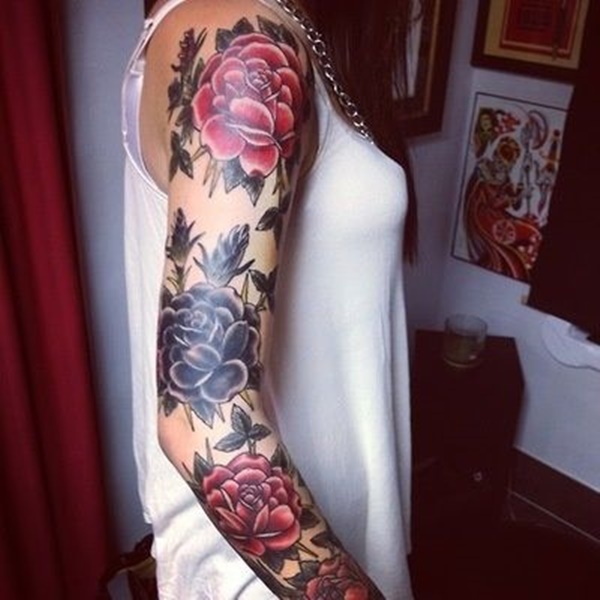 Rich and dark colors in a full sleeve, both floral and from nature. These certainly seem to be personally significant. One rarely sees an anatomically correct heart, rather than the popular Valentine shape. They look rudimentary and primitive, having online the contour and little hatching. An angel’s wing. The line work and shading in the feathers is masterful. Small, contained, very realistic. 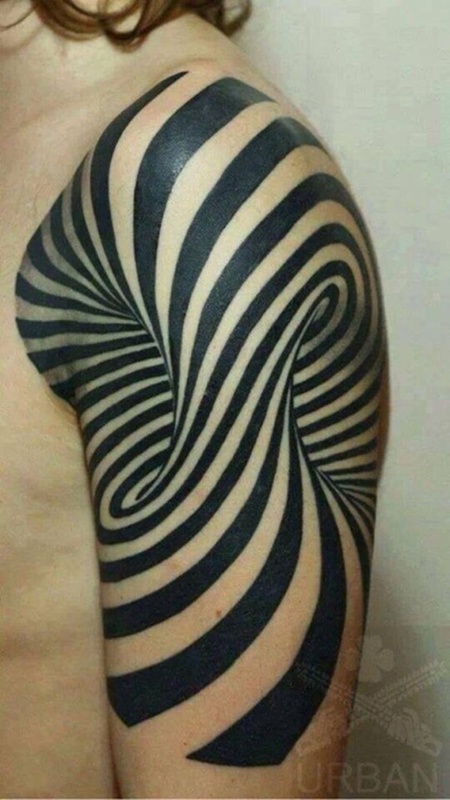 This is a tattoo that can be hidden if needed. A personal tribute to Knowledge, black and gray with accents in deep orange to set it off. Love that country music! Soft but clear color shading make this very visible. Black lines frame this firmly, while the bright saturated colors pop it off the skin and draw the eye’s attention. 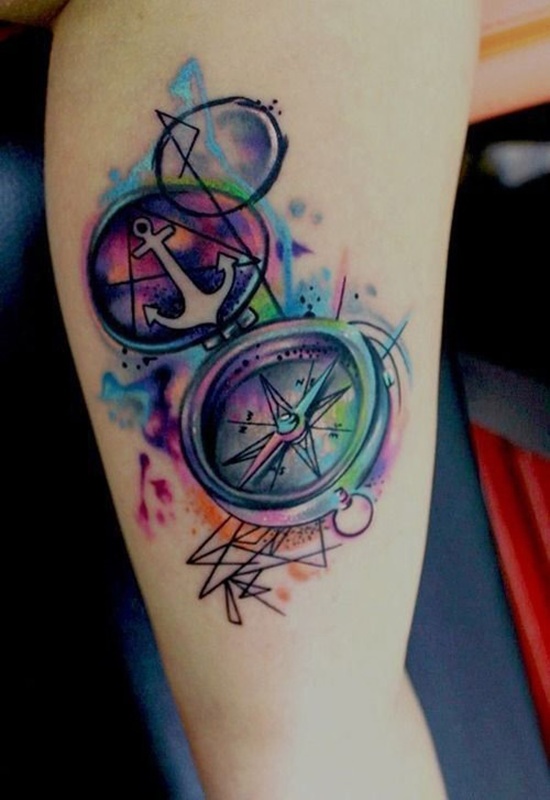 Water color nautical tattoo. Perhaps she loves sailing? 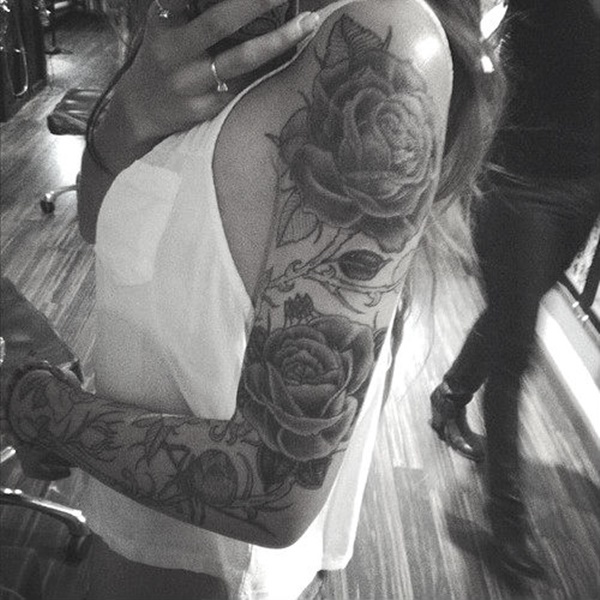 There are many tattoo ideas that help you express your femininity. The question is what do you have in mind? It can all start from an idea. These designs will give you inspiration and direction toward choosing and developing your desired design. You may pick from one of the images pictured here, or customize your own, using these ideas to fire your imagination. 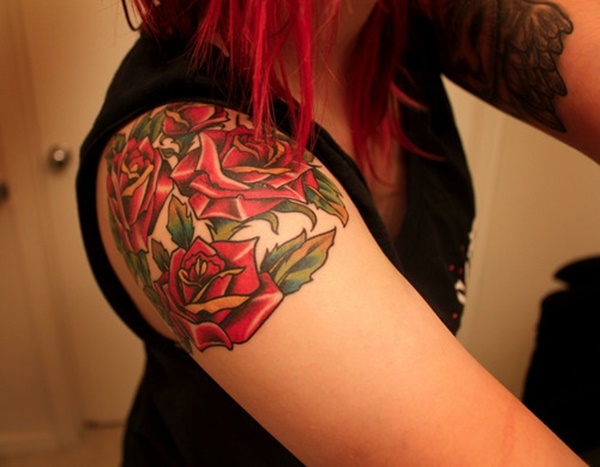 Be sure to find a skilled tattoo artist who can make your dream become a reality. 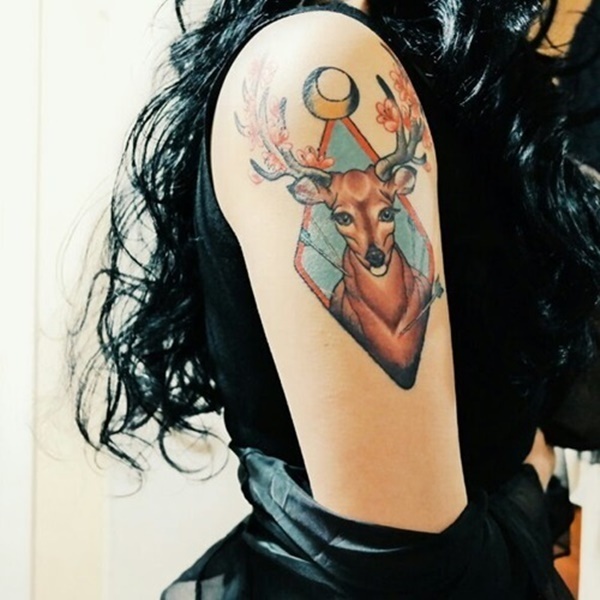 The professional tattooers all offer consultation to help you toward finding your perfect tattoo.